With construction of the first fortification of the Prague Castle in the 11 th century, the place became the seat of Bohemian princes. The buildings belong to three different architectonic periods. There is the Romanesque palace built by Soběslav I around 1135, whose ruins are in the basement. Then there are palaces built by Přemysl Otakar II, King of Bohemia and Charles IV that were erected at the site of the old Romanesque palace. The upper ground, built under the reign of Vladislav Jagellion consists mostly of the Vladislav Hall. Vladislav Hall was the largest unsupported secular hall in the world and today its wide expanse and roof supported by ribbed vaults is one of Prague’s highlights. In the 17th century Vladislav Hall was used as a meeting place, but in earlier times royal tournaments were held there with competitions in horsemanship. The horses were ridden up a wide, gently sloping staircase to the hall, which is now used by the many groups who tour the palace. Serious business went on in the two rooms leading off Vladislav Hall. 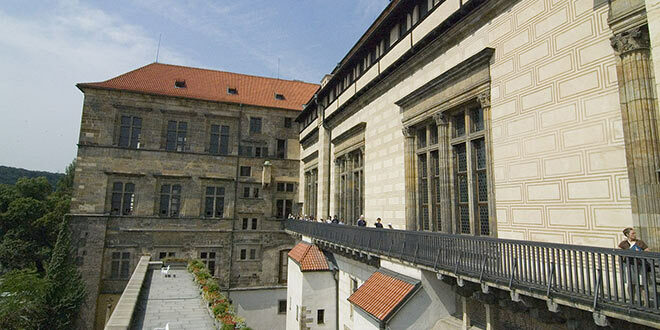 Under the Habsburgs, the castle was used as the seat of state offices, courts, and the Czech Parliament. In 1618, two imperial governors were thrown out of the high castle window. This incident is known as the second defenestration of Prague and it is supposed to be the initiation of the Thirty Years’ War. The Old Royal Palace houses the Story of Prague exhibition, which uses castle models, films and artefacts to tell the history of Prague Castle. Also armour belonging to St Wenceslas and remarkably well-preserved clothes in which Emperor Rudolf II was entombed in 1612 can be seen here.